सबसे ज्यादा डाक्टर साहब को पिछले चार महीने से , जब से उन्होने आपरेशन कराया है , इस बात की मानसिक Anxiety and deppression पैदा हो गया है , जिससे वह बहुत परेशान है ? उन्होने request करते हुये कहा कि मेरे लिये कुछ करिये, जिससे मेरी परेशानी दूर हो ? देखने मे यह दोनों त्रिक स्थान बहुत मामूली से लगेन्गे और यही समझेन्गे कि इसमे खास क्या है और इसका शरीर के साथ इतना महतव्पूर्ण समबन्ध क्या हो सकता है ? इस तरह के सवाल उठना स्वाभाविक है ? Homoeopathy ; How to make Homoeopathic Medical system more acceptable to the population of entire world ? 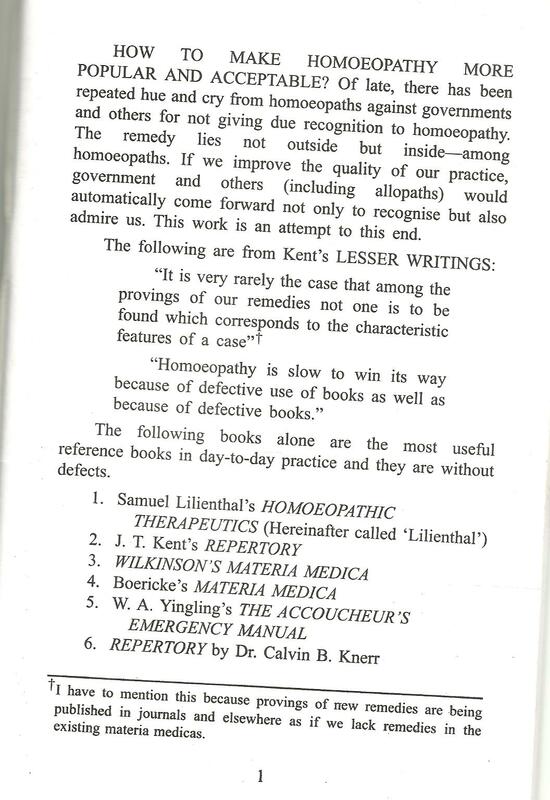 Prof. V Krishnamurti of Chennai, India has sent a book title ” An extremely thorough , exhaustive and accurate guide to successful practice of Homoeopathy “, written in english language. Prof. V.K. was a Freelance Medical Journalist and a very admirer of Homoeopathic Medical science. Like others , his interest for Homoeopathy aroused and he practiced Homoeopathy in his own way, as I have gone through the Book. 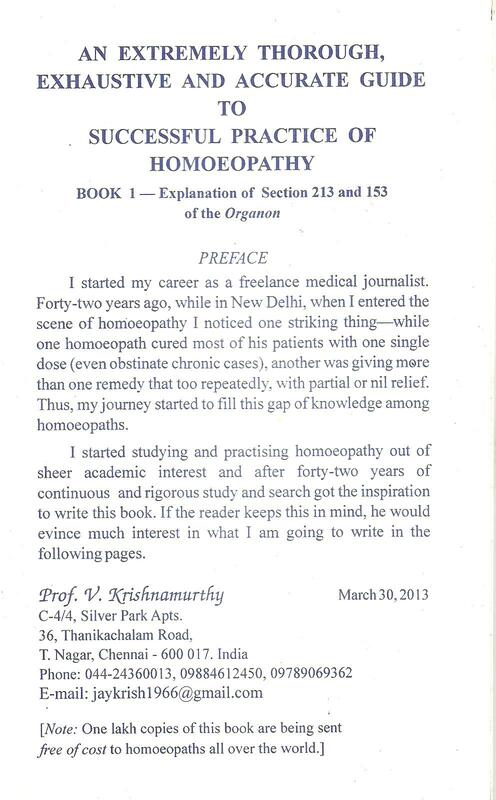 But the most Interesting sentence , that attracted my attention, is the first sentence of preface, where Murty writes likewise ; “HOW TO MAKE HOMOEOPATHY MORE POPULAR AND ACCEPTABLE ? ” The book starts with this question and that is caught my attention. Later I went with the complete book, where I read that Hahnemann have written in his ORGANON of Medicine and in this book the ideology is repeated a little bit changed in comments style. In year 1966, when I was studying Homoeopathy in Medical college, I have gone through the writtings of Dr. P. Sankaran of Mumbai [then Bombay], a noted and famous Homoeopathic Doctor of that time. Dr. Sankaran have written small booklets on various subjects in very scientific manner, applying his sense collaborating both modern medical scinece and Homoeopathy in very lucid style. Almost all of his writtings, I collected including his PUNCH CARD REPERTORY, which I stille use today and this punch card repertory admire me to pruduce punch card repertory on Boeninghausen Therapeutic Pocket Book, in year 1977, when I came back from Munich, Germany. I find in this book, what is earlier written by Dr. Sankaran, with some changes and with the experinces, what Prof. Murty have got from practice. Prof. Murty have claimed that he cured many cases by use of a single dose of Homoeopathic remedy proper selected by his own style and perception. I am practicing Homoeopathy from a long period and what I experienced , I accept honestly that I have never cured any case by a single dose to complete the entire cure. Being an AYUSH SCIENTIST, the statement looks me doubtful in view of scientific evaluation. I am not commenting his style of cure, it may be true or it may be wrong, but what I feel, I have doubt on the statement. The Big lacunea of Homoeopathic doctors is, that they present before others the success story of their cure, buit they will never share their failures. I have seen very few doctors , who accepted honestly their failures. Late Dr. A.K. 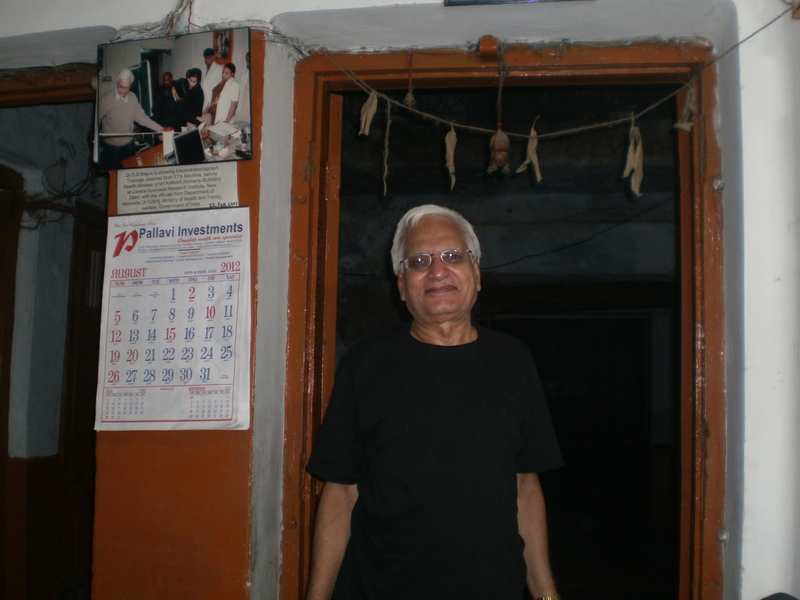 Mukherjee , DMS [ Kolkataa], DF Hom [London] of KANPUR , was a famous Homoeopathic Senior Doctor of his time in entire Kanpur city, when I go to meet him, he always, refers his failure cases. I surprised that his large number of patient advocates about the cure of their problems and Dr. Mukherjee always discusses his failure cases to me. Seldom I have never seen any homoeopathic doctor , discussing about his failure. 1- Being an AYUSH SCIENTIST, my thinking is always logical and therfore what I think, I think with the balance, seen from every corner. 2- The era of Hahnemann is changed now, if we adopt Hahnemann era, it will not be logical that much progress have been seen in every field, and ofcourse in medical science. If we adopt the Hahnemann era, we will fail and will not pace with the time. 3- Why not every Homoeopath or follower of Hahanemaan , should think over that right from the “”Medicine of experience to ORGANON 6th edition”” hahanemaan have changed his theory according to his experiences. If we go through the Hahnemann life , we find that Hahanemann wants to narrow down some changes with the principles logically, but the pressure of Homoeopaths at that time could not allowed him to make the changes in his theory in the ORGANON. 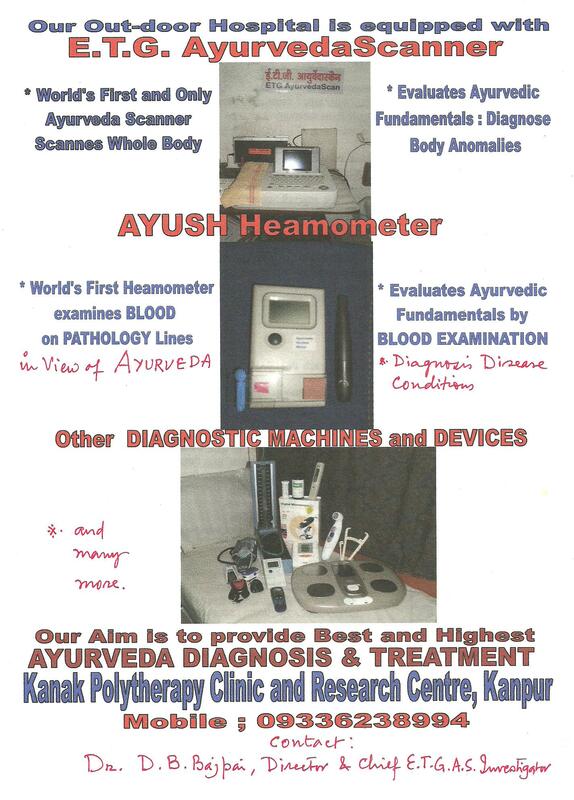 4- Most of the Homoeopathic doctor claims about their expertise and poses that he is the true follower of Hahnemann, but what they think over the last paras of Organon, where electro therapy and magneto therapy and herbal therap[y and water therapy and natural therapy and hyponotism etc are directed to apply on patient. How much of us we homoeopaths follow it ?. What about the diet and management of the case, should be followed ? 5- We are reading the translation of ORGANON in English language and not the original German version of Organon. A translation can never give the original texture of expression , flow of language, use and selection of words and grammer etc. German language have six tense, while english language have twelve tenses. If a german says “ich gehe” , it will be translated in english either ” I go ” or ” I am going ” . I have gone through some parts of Organon in German language and comparatively in english language, I felt that english translation have no original life and soul of Organon. 6- What I feel, that a patient is comming to doctor for controlling his ailments and cure. He is not comming to doctor as guneapig for experiment. The values have changed very fastly. We can not weight much more for the reaction of a given homoeopathic drugs for several days. We want result as soon as possible. Every patient think over it. Doctor is not an amature practitioner, he is a commercial person and want to bread and butter for his family and not starvation. If a doctor apply his philosophy and implement his desire on patient, the patient will leave him and will go to another doctor. 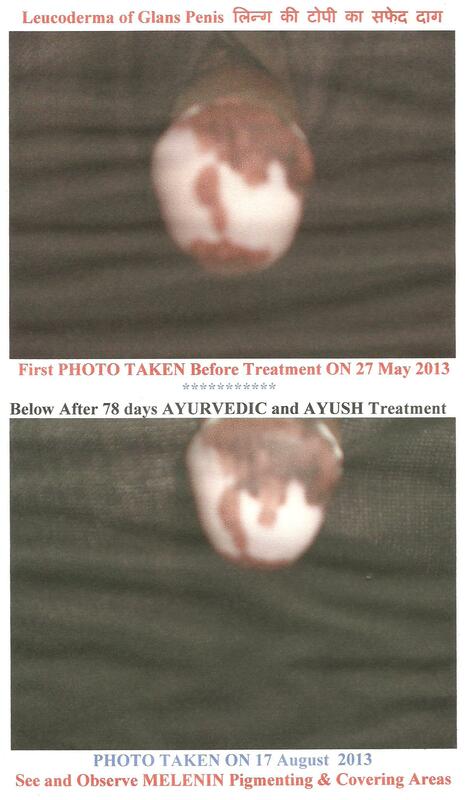 7- Recently my one 48 years old patient, who is taking treatment regularly and have taken treatment of Allopathy, Ayurveda, Homoeopathy and other modes of treatment without any relief since 24 years and now he is under my treatment from last 3 months [now he is feeling relief in his many complaints] told me that I have taken Homoeopathic treatment years and years without any relief and I am collecting data since 20 years how many persons have taken Homoeopathic treatment and got relieved or cured, asking about the homoeopathic treatment from thousands of peoples, withtin 24 years he founded only one person , who accepted that he got relief from Homoeopathic treatment. This is the time, where every practitioner should think over otherwise it will be a shamful condition for Homoeopath doctors and ofcourse for Homoeopathy medical science. 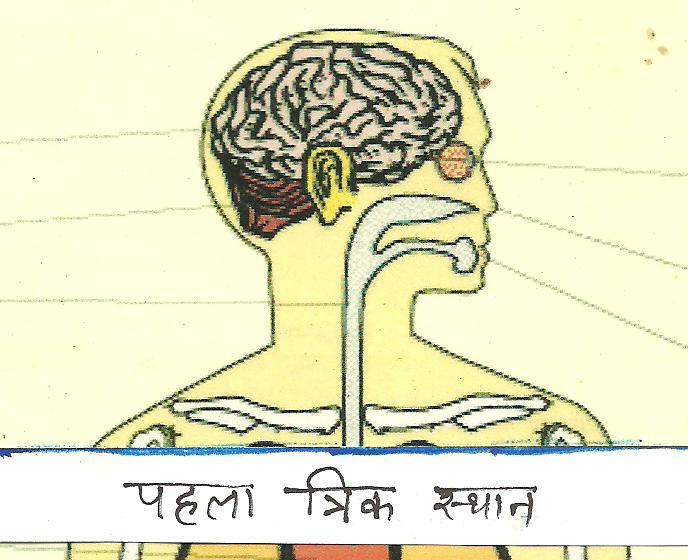 8- Every system of medicine is practised by trained persons. Novices are always felt themselves that they are now able to treat the biggest hurdleler disease conditions, without understanding the pros and cons of the patient. applying the Homoeopathic Philosophy without any practical approach. They should understand that philosophy is for the doctors and NOT for the patient. Patient is comming to you for relief of his / her sufferings and NOT for the experiment purposes. Much can be said , but main points for consideration is given here. What to do, to save Homoeopathy from hurdles ? 1- Homoeopathic Doctor’s approach for patient should be very true and practical and to help the patient. 2- Doctor’s duty is to provide relief to patient by any way as soon as possible. 3- In emergent condition such as pain and high fever and strokes, accident, he should try to first provide relief by any means. 4- Use Homoeopathic medicine with the supporting drugs of Allopathy, Ayurveda or Unani according to sign, symptom or disease conditions. 5- Use Mother tinctures single or in combination to provide quick relief to patient in hand. 6- when condition comes under controle or relief is felt by the patient, withdraw the unnecessary medications and come to Homoeopathic treatment lonely using the potentised medicine in decimal or centisamal or LM scale according to selection of remaining problems. This is the only way to save Homoeopathy medical system , with the present pace. The present time permits and needs to adopt these modern devices for diagnosis and treatment help. If we will not pace with the time, the time through the Homoeopathy far back and and a corner place into museum.